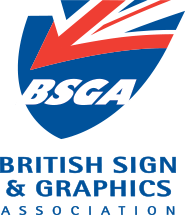 The British Sign and Graphics Association (BSGA) is the leading trade organisation for the sign industry in the United Kingdom. Our history dates back over 70 years to the 1930s when a group of leading sign makers formed the Master Sign Makers Association (MSMA) with the aim of promoting the sign industry and defending its interests against adverse legislation with a ‘Signs Defence Fund’. “The treasurer had received the sum of eight guineas to date and he suggested that we send this sum together with two guineas from general funds up to headquarters as a first instalment to the Signs Defence Fund. In the 1970s, the MSMA changed its name to the British Sign Association (BSA) with the intention of becoming more inclusive and opening membership up to the ever increasing number of smaller sign making businesses. At the start of the new millennium, in recognition of the advances in technology and the involvement of sign businesses in delivering a constantly expanding range of products and services, the association again re-branded to the British Sign and Graphics Association (BSGA). Today, the BSGA emblem is recognised as the mark of a quality sign maker. All members of the Association are vetted prior to acceptance and are subject to the BSGA Code of Practice and Obligations of Membership which set the standards required in terms of both product quality and customer service. Breaches of these standards may result in censure and/or disqualification from membership. Membership of the BSGA makes a clear statement about a sign business and anyone who has responsibility for buying signs should give serious consideration to employing the services of a BSGA member. In the event of any problem arising over work undertaken by a member, the BSGA offers a fair and effective dispute resolution service. Use of the BSGA is strictly controlled and the emblem is now a registered trademark. Any misuse of the logo is treated very seriously. Membership of the Association includes every type and size of sign business, from craftsman sign writers, through businesses that manufacture architectural and illuminated signs, to those that specialise the production of vinyl signage, vehicle liveries and digitally produced signs. The BSGA also represents a number of additional sign related business sectors including sign installers, designers and specialist consultants as well as businesses that manufacture and/or distribute materials, equipment and services used by sign makers. The Association is run by elected and volunteer members who sit on the Council and a number of specialist committees, including technical, marketing and finance. The day-to-day business of the Association is carried out by a full time Director and staff. Read more about why you should join the BSGA and information about how to join.